We originally started as a manufacturer for the garment label industry, quickly earning a reputation for our consistent high quality. With further expansion we have moved into woven edge decorative products offering the world of wholesalers, chocolate companies, florists, cake manufacturers and many more the opportunity to purchase a brilliant range of ribbon products across varied widths and colours. In 2007 we continued our further development into the decorative market by acquiring the Bandfabrik Breitenbach (Switzerland) customer base. This allowed us a further springboard into new markets throughout Europe. We now continue to add our new ribbon designs into the market, matching the latest trends while holding the core products of satin, grosgrain, sheer and lurex that have helped us grow such an exceptional group of loyal customers. 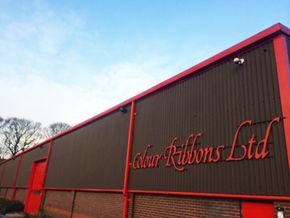 Today, Colour Ribbons is regarded worldwide as a highly competitive ribbon distributor with a reputation for working with some of the largest organisations in the world. Our team of textile technologists continue to work on the bespoke projects while the UK base continues to thrive by offering a high level of stock and great customer service. We hopefully look forward to building a working relationship going forward. 77025 - 25mm & 38mm Flower Printed Ribbon x 10 Metre Rolls!